AOL’s strategy to purchase the Huffington Post has meant that the company’s traffic numbers were increasing even as they lost traffic among other properties, however a recent look at ComScore numbers shows that after months of falling pageviews the company is actually rebounding. As the chart above shows the company’s visitor base bottomed out in July at 105.4 million and then rebounded in August to 109.2 million. When comparing those numbers to August 2010 AOL has actually witnessed a 1.8 percent increase in overall visitors. Throw in Huffington Post numbers and you have 24.4 million more unique visitors monthly or approximately 115 million unique visitors per month if audience duplication it taken out of the mix to determine truly unique visitor counts. Putting those numbers into perspective, Yahoo remained flat year-over-year and Google was up just 1 percent. 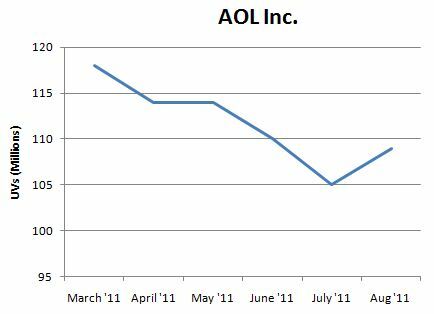 I won’t lay claim at this time that the AOL strategy has been perfect (TechCrunch numbers are hemorrhaging for example), however they are experiencing a positive user increase which if sustainable is never a bad sign. One looming issue still remains for the company, whether or not they can fill premium ad space. While the Huffington Post continues to draw an ever increasing number of pageviews they have complained in recent months that premium ad spots are not selling at the type of levels needed to maintain a profitable portal given their size.